The HMC-ALH244 is a two stage GaAs MMIC HEMT Low Noise Amplifier die which operates between 24 and 40 GHz. 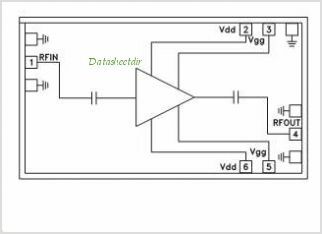 The Amplifier provides 12 dB of gain, a noise figure of 3.5 dB, and requires only 45 mA from a +4V supply voltage. The HMC-ALH244 Amplifier die is ideal for integration into Multi-Chip-Modules (MCMs) due to its small size (3.5 mm2). This is one package pinout of HMC-ALH244,If you need more pinouts please download HMC-ALH244's pdf datasheet. HMC-ALH244 circuits will be updated soon..., now you can download the pdf datasheet to check the circuits!